From The National Theatre, director Rufus Norris and writer Carol Ann Duffy give us My Country: A Work in Progress. It is a representation of what it means to be British today, and of course, it is a piece about Brexit. The performance is strikingly new and had great acclaim at the National Theatre. Norris leads the stunning cast with a verbatim piece, creating a stylised and insightful performance from the varying voices of the people of the country. The basis of the play comes from a survey conducted with people from various regions of Great Britain. This included Caledonia, The North East, Northern Ireland, Cymru, The East Midlands and The South West. The material is from spoken interviews and is woven into Duffy’s funny and engaging script. It gives an insight into the wide range of thoughts straight from the mouths of the British people. The concept of the production is an effective social project. The setting is Westminster, as the results of the Brexit referendum are about thebe finalised. We see those representing areas of Britain as they come together to witness the results, in a meeting headed by Britannia herself. Whilst there, in verbatim style, the representatives make the voices of their area known to the audience. Carol Ann Duffy is a writer who needs no introduction. The script is bold and shares a varied voice of the British public. The characters within the production are personifications of the areas of Great Britain. Being a verbatim piece, they have collected real life accounts of people from each country of Great Britain that discovers the overarching impact of Brexit and what it means to be British today. Norris has a cast like no other. The company consists of Seema Bowri, Cavan Clarke, Laura Elphinstone, Adam Ewan, Penny Layden, Stuart McQuarrie and Christian Patterson. In a beautifully stylised and thought-provoking manner, the cast are personified characters of each of the areas they represent. They are the voices of the material that was gathered through recorded interviews. 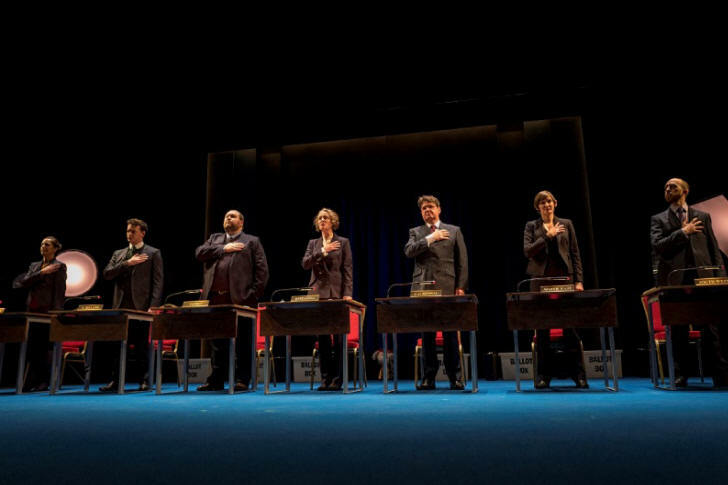 The cast embody the areas of the country whilst voicing the opinions of those within it. It makes for some beautiful and humorous moments. The cast display light-hearted stereotypes that instantly show us where they are from. Each cast member is fantastic at carrying the regional accent of the surveyed area and a sequence of sharing of the food shows others making fun of Caledonia’s controversial characters. The cast give a human quality to the areas of which they represent, showing the nuances of the people who live within them. Britannia, played by Penny Layden is the central force that brings the regions together. The play is set just as Brexit results are about to be called and each location is eagerly waiting to know how their people voted. Whilst the rest of the cast represent the voices of their residents, Britannia is the voice of central government. Layden is superb at grasping the essence of the speeches of politicians we remember hearing through Brexit campaigning and the aftermath. Her Boris Johnson and Nigel Farage were particular highlights. The rest of the cast are brilliant and work completely in sync with each other, highlighting the diversity and wide ranging thoughts of the modern day people of Britain. The voices of the people are wide and varied and Norris has a light-hearted approach mixing the conflicting views into the same narrative. The production itself has no political agenda. Duffy merely presents the voices of the people, word for word. This is gives a deep insight as to what Brexit means to the people of Britain and could pose as an explanation of the Brexit result.